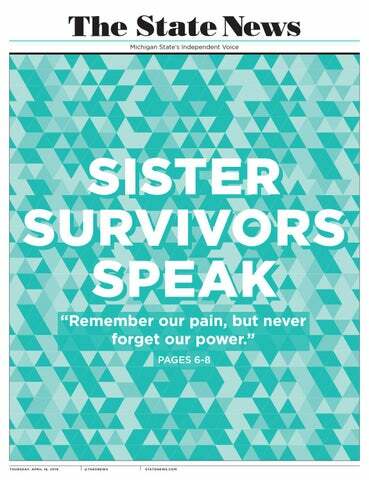 The exhibit will tell survivors’ stories of healing by showcasing teal ribbons, artwork, signs of protest and unity from groups like Reclaim MSU, a timeline of survivors’ accusations and more. It will be held in the main gallery of the museum from April 2019 until early 2020. The exhibit will have two galleries: One that includes objects of pain, and another that includes objects of healing. The exhibit may also incorporate a closet, where survivors can leave their green and white Spartan gear until they are ready to wear them again. Amanda Smith, a survivor and co-curator of the exhibit, said it has been her job to ensure that the exhibit solely displays the survivors’ side of the story. There will be no photos of Nassar, and his name will most likely only be seen in newspaper clippings, she said. The exhibit will, however, try to address signs of predatory behavior by displaying gifts Nassar gave to survivors to groom and manipulate them. Smith said the organizing committee also wants to make sure people have the resources to get help if needed, and to let survivors know it’s okay to speak up. The idea for the exhibit came after the teal ribbons placed on trees around MSU’s campus by survivors and their parents were removed after they became infested by gypsy moths. Museum employees wanted to ensure the survivors and their parents were the ones who took the ribbons down. “Just the thought of them being taken down without care and going away, there was something didn’t feel quite right about that,” Curator of Textiles and Social Justice Mary Worrall said. MSU Museum Director Mark Auslander said those at the museum were touched by seeing the ribbons on campus and wanted to find a way to preserve and display them. He said the committee has also been working on an interactive app, which would allow survivors to find the tree they placed their teal ribbon on. Worrall said the exhibit has been developed through a process of “community curation,” meaning the museum works in cooperation with communities affected by and involved in the story. Leading up to and following the exhibit’s opening, there will be three more events in the exhibit’s continuing “Speaker Series,” on Feb. 12, Feb. 20, March 12 and April 23.